We introduce a simple but effective means of removing ENSO-related variations from the Indian Ocean Dipole (IOD) in order to better evaluate the ENSO-independent IOD contribution to Australian climate—specifically here interannual variations in Australian region tropical cyclogensis (TCG) counts. The ENSO time contribution is removed from the Indian Ocean Dipole Mode index (DMI) by first calculating the lagged regression of the DMI on the sea surface temperature anomaly (SSTA) index NINO3.4 to maximum lags of 8 months, and then removing this ENSO portion. The new ENSO-independent time series, DMINOENSO, correlates strongly with the original DMI at r = 0.87 (significant at[99% level). Despite the strength of the correlation between these series, the IOD events classified based on DMINOENSO provide important differences from previously identified IOD events, which are more closely aligned with ENSO phases. IOD event composite maps of SSTAs regressed on DMINOENSO reveal a much greater ENSO-independence than the original DMI-related SSTA pattern. This approach is used to explore relationships between Australian region TCG and IOD from 1968 to 2007. 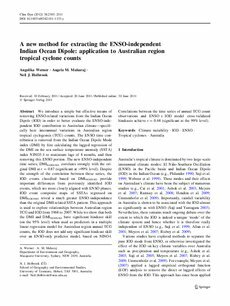 While we show that both the DMI and DMINOENSO have significant hindcast skill (on the 95% level) when used as predictors in a multiple linear regression model for Australian region annual TCG counts, the IOD does not add any significant hindcast skill over an ENSO-only predictor model, based on NINO4. Correlations between the time series of annual TCG count observations and ENSO ? IOD model cross-validated hindcasts achieve r = 0.68 (significant at the 99% level).